My 91 year old grandma Lil died this morning. I learned of her passing right after I sent my son off to school: it’s his twelfth birthday, so I’m feeling sad and happy all at once today. Downs. And Ups. Life seems just packed with them lately. There is devastation in Japan. There was fun, and lots of laughter, at dinner last week with food blogger friends Chris and Karen, MJ, Jen, Ken, and Gail. There is unrest in Libya. There was Central Park on a gloriously beautiful day with my daughter. Today it is cold and snowing. Yesterday, I saw new growth on the strawberry plants in my garden. My grandma Lil was one of a kind: a smart, resourceful, and resilient woman. She had a tough exterior, but was extremely generous and loving inside. Crispy Onions with Eggs was Lil’s favorite breakfast. It has been a while since we shared a meal, and we won’t be able to do so again, so I made these this morning in her honor. I can only hope that I did this dish justice, Lil. Love and miss you. XOXO. 1. Melt butter in a cast iron skillet over medium-high heat. When the butter is sizzling, toss in the diced onion. 2. Keeping the heat at medium-high, cook the onion for 4-5 minutes, stirring every now and then. Don't worry if some of the edges darken and burn a little- they are supposed to- these are crispy onions, remember? On the other hand, you don't want the onions to be black, so do turn the heat down a bit, if necessary. 3. When the onions are done (they should be well cooked, with some dark brown/black edges), turn off the heat. 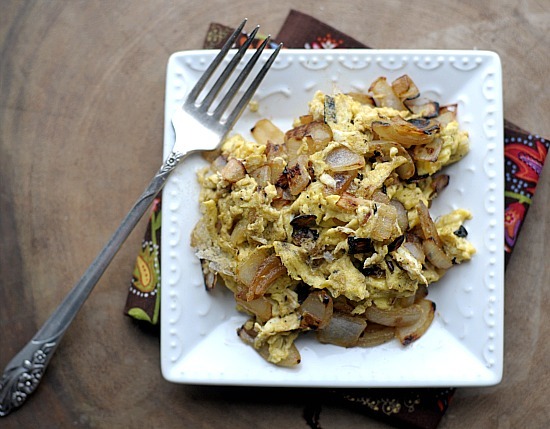 Mix whisked eggs with heavy cream and pour over the onions. Stir around with a wooden spoon- it won't take long for the eggs to be done because the pan was so hot- be careful not to overcook. 4. Transfer to a serving dish. Add salt and pepper to taste. I’m very sorry for your loss… sending you love and comfort today, and Happy Birthday blessings to your son! Oh Winnie, sending good thoughts for your family at this difficult time. Even when someone has had a long life as your grandmother did, it’s still hard to let them go. Oh WInnie :( I’m so sorry. I’m sure your grandma is smiling down from Heaven knowing that you were so sweet to make this breakfast in her honor, wish sounds marvelous by the way. Hugs coming your way! Winnie, I’m so sorry to hear of your loss. My grandmother was one of my favorite people + losing her was something I still struggle with…so, I feel for you. Oh I am so sorry Winnie! It is so hard to lose someone but it sounds like you and your grandma shared some really great memories. And some great food! I am so sorry for your loss. My thoughts are with you. It’s so difficult to lose someone close, but the wonderful memories you shared will always be with you. I’m so sorry to hear about your grandmother. It’s never easy losing anyone. I think making this meal is a great way to honor your grandmother. Nothing says love like a good meal. I’m also sending my thoughts and prayers for you and your family Winnie. The recipe is such a great way to honor your grandmother. Cherish your memories and celebrate her life!! I hope your family will be able to find a way to enjoy your sons birthday!! Sorry to hear about your grandmother. Sending my best. So sorry to hear about your grandmother. It’s always a tough thing to go through. Sending you my thoughts.